I don’t think that all art should be hung on walls. I don’t think art for me is that precious either. . . . The preciousness is the process . . . the making. Andrade believes that “we have to exist in the whole world, not in parts of the world” and that her interactions with other artists and Indigenous people spark dialogue—conversations with the world. [iii] In 2012 Andrade came to the Indian Arts Research Center (IARC) at the School for Advanced Research as the Eric and Barbara Dobkin Native Artist Fellow. 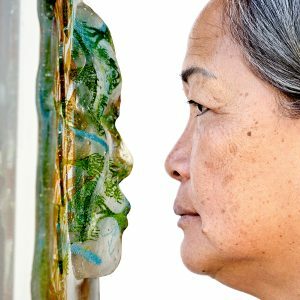 Maile Andrade faces a facsimile of her own image created by screen-printing onto multiple layers of glass, fusing them, and then slumping the glass into a mold of her face. Originally from O’ahu, Maile Andrade is now an artist and a professor at the Kamakakūokalani Center for Hawaiian Studies at the University of Hawai’i-Mānoa, where she developed and teaches in a Native Hawaiian creative expression program. She currently has an exhibition at the Honolulu Museum of Art entitled Ka ‘Opua Ā Hina. When my husband bought [gifts] for my kids, he sailed on a canoe [and didn’t] send them home. . . . And as we gift, we tell the story, how this thing moved, went, made, and all the people that touched it. So I think it’s important. . . . If there was an earthquake [and] it cracked, then it adds to the story, then I think that’s the valuable part, that’s the fun part. No, I’m not fixing nothing. According to Andrade, the work is only the first step in a procedure that involves understanding, thought, even being itself and that then allows the artist to come back to the work and create something that connects artists both ancestral and contemporary. Glass plate, Maile Andrade (Native Hawaiian), 2012, glass, pigments, 10-1/16 x 10-1/16 x 1-3/8 in. Photo by Addison Doty. Cat. no. SAR.2012-3-1. For this piece, Andrade took glass stringers, glued them onto a piece of clear glass, and fired the piece with stringers along the bottom to keep the shape intact. Then, she cut the sheet into widths of just over one-fourth of an inch and rearranged them into an alternating pattern. Every other strip had rods on top, and the alternating strips had rods on the bottom. This process gave the piece depth so that it looks like a weaving. 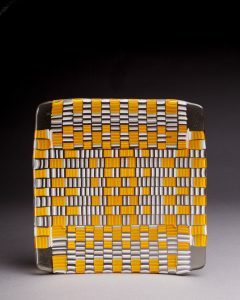 Finally, Andrade placed the hot glasswork in a plate mold (a process known as “slumped glass”). She fired the piece three times altogether: once to attach the stringers, once to fuse the strips into one piece of glass, and once to slump it in the mold. The first piece Andrade donated to the collection is a plate that appears to have been woven, which she made by twining strips of glass together and then firing them in several stages until they became one piece of glass. I’m using a contemporary medium. I’m also referencing a piece that inspired the contemporary medium, and in some ways hopefully it still has that connection. It’s not totally disconnected, because I think that’s what the old things do for us. The second piece Andrade donated to the IARC collection is entitled Observation without Judgment. To make it, Andrade fused three layers of glass, each containing different images (dragonflies, leaves, and a woven pattern), as well as some text, into one piece that she then slumped into a plaster mold of her own face. She spent many hours creating and drying the molds, as well as carefully firing and fusing the layers of glass. 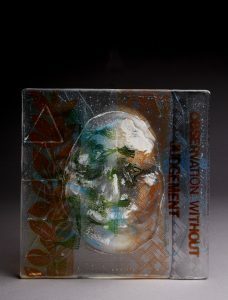 Glass plate, “Observation without Judgement,” Maile Andrade (Native Hawaiian), 2012, glass, pigments, 10-1/16 x 10-1/16 x 1-7/8 in. Photo by Addison Doty. Cat. no. SAR.2012-3-2. To create the three layers of this piece, Andrade screened glass powders onto sheets of clear glass and then tack-fused the sheets, which sealed the colors and images into the glass. The first layer shows dragonflies and the second plants. The third is made of strips of glass: one with text, one with a woven pattern, one that is clear, and one with a leaf pattern. All three layers were then fused together in a firing that took about twenty-four hours. Finally, Andrade slumped the solid plate of glass into a plaster mold that she made from her own face, for a total of five firings. Although she used the same mold of her face to shape each piece in the series, Andrade wanted them all to be slightly different, too. I changed the size because the idea or the concept behind this piece is it’s my face, and it’s all those things that make me who I am. And also those things I’m thinking about. So the different faces really represent the different sides or the different moods. We’re never the same. We’re always changing. We’re always in flux. Unless otherwise attributed, all quotations come from interviews with the artist at the IARC, May 29, 2012. [iv] Susan Brown McGreevy, Indian Basketry Artists of the Southwest: Deep Roots, New Growth (Santa Fe, NM: School of American Research Press, 2001). Each year the Indian Arts Research Center at the School for Advanced Research provides three fellowships to Native American artists. The piece here is one in a new blog series, produced by the SAR Press acquisitions editor, Sarah Soliz, that will provide an in-depth look at a particular artist and his or her work produced while in residence with SAR. Learn more about our Native American Artists Fellowships here. Subscribe to Voices from SAR: A Blog and receive the posts straight to your RSS feed!